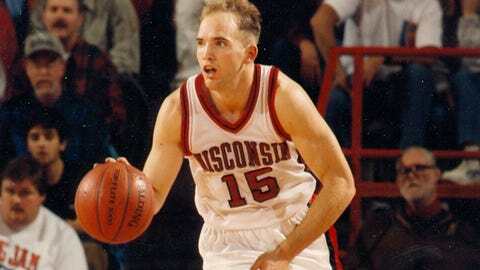 Guard Andy Kilbride averaged 7.4 points per game for the 1993-'94 Wisconsin Badgers team that started the season 11-0.
mark with a win on Saturday against Eastern Kentucky. streak of 15 straight tournament appearances. just seems like they’re all on the same page. So there’s a lot of continuity. shoot the ball, I think, better than we did 20 years ago. year’s team is really mentally tough. They’re a better road team than we were. slashing small forward to us and got to the rim a lot. teams. But it looks like it’s evening out. FSW: How do you think the two teams’ starting fives compare? Was the 1993-’94 team this balanced? into the lane and make something happen. year’s team, and they can really stretch the defense. don’t see that happening with this team because they’re so balanced. don’t want to wax on about how great I think Bo is, but I do think he’s great. right in with the seniors. they’re winning, but it’s good chemistry on this team. school record for wins to start a season in the modern era? AK: It’s great. We’ve talked about it maybe a couple times. real well, but some of the upperclassmen I’ve met three or four times. They’re just great student-athletes. They’re great people. makes us look better every year because of Bo and his teams and these guys. accomplished 20 years ago but what these guys are doing right now. 1993-’94 team and the 2013-14 team? AK: Our team. No question. FSW: What’s the final score? lot of scoring, and I think we’d win.